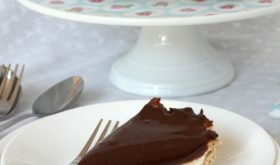 I’d suggest you make this recipe using Philadelphia cream cheese or Britannia cream cheese but you could use home made hung yogurt as a substitute if you cannot source cream cheese. To prepare hung yogurt, take two cups of yogurt/curd and place it in a sieve for a couple of hours to let the water drain. Use the water to knead chapati dough and use the hung curd in place of cream cheese. The original recipe called for digestive biscuits which I substituted with Britannia Marie biscuits. Grease the sides and bottom of a 12" pan and keep aside. In a bowl, crush the digestive biscuits with a rolling pin and add the soft butter. Mix the crushed biscuits and butter with your fingers such that the mixture resembles coarse sand. Place this mixture in the base and sides of the greased tart pan and press with your fingers to about 1/3" thickness. Chill the biscuit base for an hour. While the base is chilling in the fridge, prepare the cheese cake mixture. In a small bowl, add the gelatin along with 3 tbsps cold water. Keep aside for a few minutes to allow it to bloom (the gelatin absorbs the water). Place the bowl over very low flame and stir till the gelatin dissolves. It should not boil. Turn off heat and cool. Keep aside. To prepare the cheesecake, place the cream cheese, sugar and vanilla essnce in a large bowl. Using an electric mixer, beat together till it forms a smooth mixture. Add the gelatin mixture and mix well till incorporated. In a separate bowl, whip the whipping cream till peaks form and fold it into the cream cheese mixture. Remove the tart pan from the fridge and pour the prepared cheesecake mixture over the biscuit base. Use a spatula to smooth out the top. Cover will a cling film or plastic wrap and place in freezer for at least two hours. Now prepare the ganache. Pour the cream into a stainless steel vessel and place over low heat. When bubbles appear along the edges, turn off heat. Add the grated chocolate and mix. Place lid and keep aside for 3 mts. After 3 mts, use a wooden spoon to stir in one direction such that the cream and chocolate blend together to form a smooth mixture and no trace of chocolate chunks are left. The chocolate should melt completely. Allow to cool for 15 mts at room temperature. 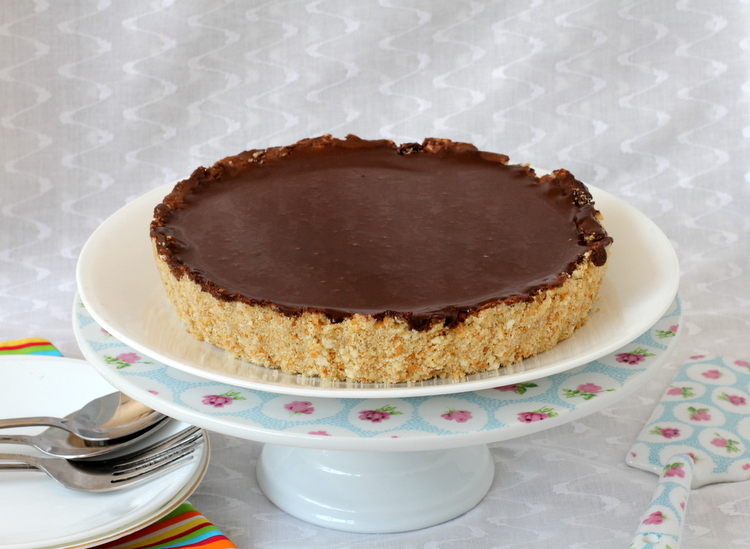 Remove the tart pan from fridge after two hours and pour the room temparature ganache over the set cheesecake. Cover with plastic wrap again. Set in fridge for at least 6 to 8 hours or overnight. Remove the tart pan from the fridge and place on a warm kitchen towel for 3 to 4 mts. This will help to slowly loosen the base of the tart pan. Carefully lift the base of the pan and place the chocolate cheesecake on a serving plate. Cut into wedges and serve. Gelatin can be subsituted with china grass/agar agar (vegetarian). Use 1 1/2 tbsps of agar agar strands and place in 1/4 cup of warm water. Keep aside for 15 mts. Bring the agar agar mixture to a boil and simmer till the agar agar is fully dissolved. Turn off heat and cool a bit before mixing with the cream cheese mixture. If using hung curd/yogurt (instead of cream cheese), add 1/2 cup of freshly made crumbly paneer and blend to a smooth paste. By Sailu Published: May 26, 2013 No bake chocolate cheesecake is a classic among easy dessert recipes. 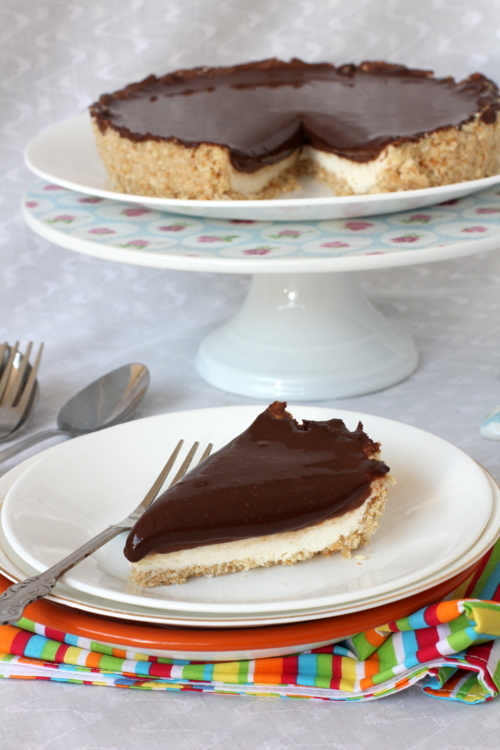 Minimal ingredients like cream cheese, chocolate and biscuit base go into its making. Looks yummy! If it is an Indian cheese brand, which one can we use? Hi sailu garu pl can u tell which indian cheese canwe substitute with. Britannia cream cheese. I heard that another brand Delecta is also available. Which cream cheese should we select in Britannia. I mean any flavoured one or just the original. Should the cream cheese be the block one? Original cream cheese of Britannia. Thanks a lot for ur reply. Will surely try. What whipping cream should we use? 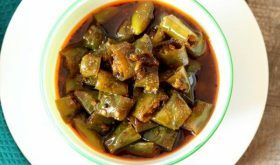 Anything that u can name which we get in india? Rich, Golden Mark, Tropolite whipping cream. Thank u for ur reply, but could u also suggest as to which stores we get these whipping cream. I heard you get baking products at Waltax Road (next to Chennai Central). You will get Rich’s and Tropolite brands there. Place in freezer and when you want to use it, remove from freezer and place it in the fridge the earlier night and the next day morning use as required. Do not store the whipped cream (what you have whipped) in the fridge. Use it up. You can freeze the unused whipping cream for a few more days. Oh my goodness, Cheesecake looks gorgeous and irresistible. Can we prepare whipping cream at home? You buy store bought whipping cream and whip it till peaks form. hi sailu is there a substitute we can use for the gelatine? Yes, you can use agar agar also known as china grass. Take about 1 1/2 tsps agar agar powder and place in 3-4 tbsps hot water for 10 mts. Follow the rest of the recipe. I tried ur recipe and taste was tremendous 🙂 but the biscuit crust didnt set well , should i freeze it or refridgerate it during the making ?? And wat could hav gone wrong for the biscuit crust not to have set well..?? where in bangalore do we get Original cream cheese of Britannia. hi nice recipe , im going to try it this week, butter salter or unsalted ?